Donna Williams, from New York City’s Metropolitan Museum of Art, heads the Multicultural Audience Development Initiative which is recognised as one of America’s leading audience building programs. Donna Williams inspired people in Australia as she discussed how she brought in diverse new audience for the Metropolitan Museum of Art by generating partnerships with ethnic media, community associations, chambers of commerce, educational and religious institutions and individuals. Integral to the success of Donna William’s audience development strategies, is the Multicultural Advisory Committee. The Committee is composed of New York’s Hispanic, Latino, African American, American Indian, South Asian, and Asian American cultural leaders and organisations. The Committee articulates strategies for establishing alliances between communities and the Museum whereby interest in the Museum is fostered among New York’s culturally diverse communities. Building more multicultural and multigenerational audiences by making personal connections, using the media in innovative ways, and partnering with diverse organisations are some of the issues that Donna Williams explored in her public talks. 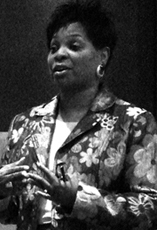 Donna Williams as the spokesperson for the Metropolitan Museum of Art on the topic of diversity in the arts lectures extensively across the America. Her work has been recognised widely: she has received a proclamation from the New York City Council for her community leadership was featured in CaribNews’ ‘Salute to Women Achievers’. She was also honoured with the 2004 Beacon Award for the Arts by the National Coalition of 100 Black Women. She and the Museum were honoured with the Robert Mangum Leadership Award by 100 Black Men, Inc.
Donna Williams was honoured with the 2003 Women’s History Award from the Miracle Makers, Inc. in recognition of the Initiative’s positive impact on New York City community life. Donna Williams was selected by the National Basketball Association, New Jersey Nets, and CMC Communications as an honouree at the first Annual Black History Month Salute to African-American Community Leaders in recognition of her empowering involvement in the African American community throughout New York and New Jersey. The Donna William lecture tour was funded by the Australia Council for the Arts through the Cultural Engagement Framework. Additional support provided by Arts Victoria and the Multicultural Commission. Venue support provided by NGV International and the Art Gallery of South Australia. Promotional support provided by the Australian Multicultural Foundation, RMIT Business and the Nexus Multicultural Arts Centre in SA.